ReproLife™ CX Cervical Epithelial Medium Complete Kit is a new medium optimized for the culture of Normal Human Cervical Epithelial Cells (HCxEC). ReproLife™ CX supports the growth of these cells over a period of at least 5 population doublings. 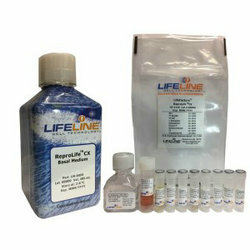 ReproLife™ CX is offered in a kit format composed of basal medium and associated supplements and growth factors called “LifeFactors®.” This kit allows preparation of fresh medium in your laboratory, extending shelf life and enhancing performance.